There is at least one point in everyone’s life where they need to save money fast. Some people want to set up a small emergency fund before paying off debt. Others may need new tires for you car before winter comes. No matter why you need to save money quickly, these 10 tips about how to save money fast should help. Some of these tips and tricks will increase your cash, while others will reduce your spending. It is imperative that you take the extra cash you earn or save by reducing your spending and put it in a safe place or a bank account. Why? You must not spend it on something else. You need to actually save it for your goal. Now, on to my list of 10 easy ways how to save money fast. Selling things around your house is the quickest way to raise cash in a pinch. Go through your home and look at all of the stuff you never use or no longer care about. Put it all in one area while you continue to look for more stuff to sell. When you’re done rounding up stuff to sell, take a look at the pile and make sure that you won’t need any of the stuff again in the near future. Selling stuff you’ll need to buy again is a quick way to lose money because chances are you’ll sell it for less than you could buy a new one for. Some of the methods above are quicker than others. If you need to sell something quickly, craigslist.org or a yard sale is probably your best bet. If it is a big ticket item, you’ll probably get more money if you list it individually on craigslist than you would if you were to sell it at a yard sale. Of course, if you have a bit more time, eBay might make you the most money. Whichever way you decide to sell your things, make sure you know the true value before you sell an item. You don’t want to get ripped off selling a $500 item for $50 because you didn’t know it’s true value. Eating at home is one of the easiest ways to save money quickly. This means you can no longer eat out at restaurants or buy convenience foods at gas stations and convenience stores. If you simply cook all of your own meals at home, you won’t have to pay for other people’s time to cook and serve for you or any of the other costs you’re paying for when you dine out. This means cutting out your trips to Starbucks or your local coffee shop, too. If you really need to save money fast, then you shouldn’t be spending any money on food or drinks outside of what you can prepare at your home. If you have a day job you probably won’t be at home for lunch. That’s OK, because spending gas money to drive home would actually cost you more than staying at work and eating there. Rather than eating out for lunch or ordering take out for lunch every day, you’ll need to start bringing your lunch to work. Whether you want to eat leftovers, bring a typical cold cut sandwich, or prepare a quick microwave meal at work, skipping the daily lunch out will save you money faster than you think! One of the quickest ways to make some extra money is to work more hours and/or work some overtime hours at work. If this option is available to you, you’ll be able to get some extra money as early as your next paycheck! Overtime is even sweeter because you’ll get 1.5x your normal wage in most cases. If you’ve maxed out the amount of time you can work at your current job and you still need more money, you could try getting a second job. Working two full time jobs or even a full time and a part time job can be stressful, but it will greatly increase your earning power for the short amount of time you need some extra money. If you don’t want to have a more permanent job, try checking out your local temp agency. They can normally set you up with a quick job to make some extra cash and it won’t be a permanent solution. Getting a roommate is a more permanent way to save money quickly, but it pays off in many ways! In addition to paying you for your rent or mortgage, you can also split your utility bills like electricity, water, trash, cable and internet with your roommate. You’ll sacrifice some privacy, but your wallet will be much fatter for it. Just make sure you get a good roommate that you’ll be able to get along with for the long run and it doesn’t violate your lease. Chances are your cable bill is at least $50 a month and can be well over $100 a month depending on what package you have. The quickest way to save money on this bill is to eliminate it altogether. You can replace much of your entertainment needs with a cheap or free alternative such as over the channels with an HD antenna, if necessary, or Netflix streaming. Of course, some people absolutely refuse to cancel cable. If this is you, at least try to lower your cable bill. Try out some of my tricks to save $100s on your cable bill over a year that I shared in this article. Insurance can easily be one of your largest bills, whether you pay monthly, every six months, or once a year. Do yourself a favor and make sure you’re getting the best rate you can get while staying with a reputable company. Call around and get quotes for your car insurance, home insurance, renters insurance and any other insurance you may have. We saved a few hundred a year switching our car insurance, which shocked us because we thought our previous company would always offer us the lowest rates. Unfortunately, insurers don’t always reward their loyal customers. Get quotes to see if you can save hundreds a year, too! If you need money quickly and you’re in debt, one of the quickest ways to free up money is to get your interest rates lowered. While it is probably near impossible to get your home mortgage or car loan interest rate lowered without refinancing, you can get your credit card interest rate lowered fairly easily in some cases. The first thing I’d do is try calling your credit card company and asking them to lower your rate. If they say no, say thank you, hang up, call back and try again. If they won’t lower your rate no matter what, then you might want to consider 0% balance transfer credit cards if and ONLY if you have sworn off incurring more debt. 0% balance transfer credit cards are a great way to lower your interest while you’re paying off debt, but they are very dangerous because they increase your credit limits and allow you to go into more debt. Never make a purchase on your new 0% balance transfer credit cards and don’t you dare spend a dime on the card you transferred your balance from. Going into even more debt will get you in an even stickier situation and you have to stop incurring more debt right now! If you’re ready and think you can handle the requirements, check out my list of the best 0% balance transfer credit cards available today. Don’t forget, if you can refinance your car or mortgage and save money with lower rates, definitely consider it. Unfortunately, they’re not normally ways you can save money fast. Take a look on your bank statement and credit card statements and look for recurring payments you make every month, quarter or year. Do you actually use all of these services? Whether you’re paying monthly for a Netflix, Hulu Plus, a gym membership, a magazine subscription or some other membership or subscription, if you don’t use it, quit paying for it! Cancel these memberships now! Some will require you give notice before canceling. If that’s the case, go give notice today and cancel as soon as you can. There is no point in spending money you have no use for, especially if you need money now! Need More Ways To Save Money? I’ve worked with personal finance experts and many other personal finance bloggers to put together the ultimate list of money saving tips to help you save money. In fact, there are over 123 ways to save money, all in one place. Go check out the post now and you’ll be sure to find a few ways to save more money today. Just remember, you’ll quickly get back into a spot where you need more money fast if you don’t change your financial habits. Turn your financial life around! Figure out why you got into debt and how you can get out of debt even if you don’t know where to start. 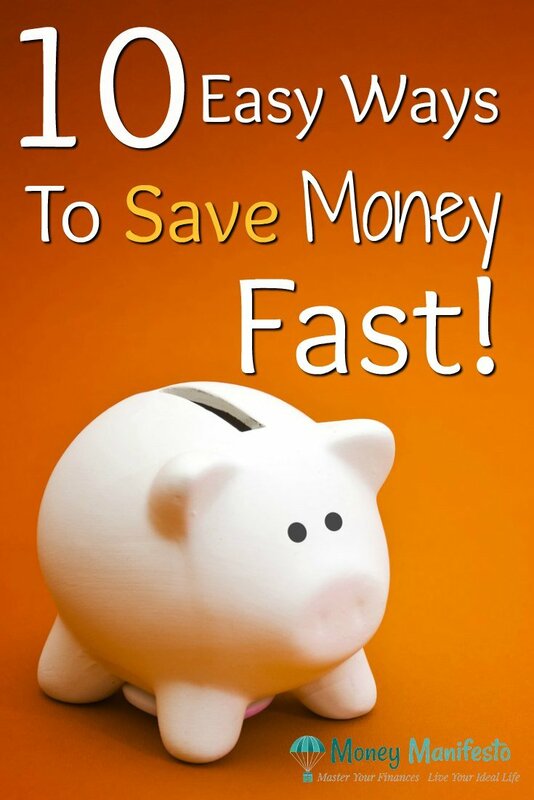 What is your favorite way how to save money fast? I’d love to hear your innovative tips and tricks in the comments below! « When Will We Learn Enough Is Better Than Wanting More? STOP! spending money. The only thing you need to do. Most people spend on stupid stuff like lattes, cable TV, shoes you don’t need and overpaying on everything. I grew up poor and worked hard my whole life, and now all that smart saving and NOT spending to keep up with the Jones’s has paid off. I can go on cruises, buy what I want and totally enjoy my life compared to most of my siblings who don’t have a clue, can’t afford to go anywhere, and still are paying on their credit card debt. Really great list. We’re employing most of these strategies ourselves and it’s helped us a lot. Glad to hear the list is a keeper!